Were you looking for Jiralhanae Ultras? The Captain Ultra is the third highest attainable rank a Jiralhanae can achieve, next to Jiralhanae Honor Guardsman and Chieftains. Captain Ultra is the highest Captain rank in the Jiralhanae ranking system. 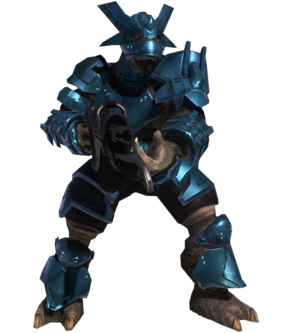 They seem to be the Jiralhanae equivalent to a Lieutenant Colonel or Commander as well as a Sangheili Ultra and can command larger packs than their lesser ranks. They are stronger and more experienced than other Jiralhanae infantry and Captain ranks. Jiralhanae Captain Ultras are trained to be immensely strong and agile. On the battlefield, Captain Ultras are often in command of Jiralhanae packs and files or lances that are made up of lower-ranking species like Kig-Yar or Unggoy. Captain Ultras wear cyan power armor, which signifies higher rank than the gold Jiralhanae Captain Majors. The armor offers very high resistance from most weapons to protect its user. Captain Ultras are armed with a wide assortment of weapons. Most often, they wield the Type-25 Brute shot. However, they also use Type-2 spike grenades, Type-25 plasma rifles, Type-25 spikers, Type-51 carbines, and Type-33 fuel rod guns. Captain Ultras are sometimes equipped with Covenant equipment like a bubble shield, power drain, radar jammer or a flare. They occasionally use deployable covers for additional protection. Captain Ultras are very strong opponents. They can take multiple hits from any non-explosive weapon to kill them. The best alternative to an explosive or powerful weapon for these hardy Jiralhanae warriors is the battle rifle to the head, which allows the player to hit them from a distance and kill them with few shots. A single plasma grenade can kill them along with a spike grenade, provided they detonate nearby each other. Ultras are rare on lower difficulties but more common on Heroic and Legendary difficulties. The Type-25 plasma pistol's overcharge shot can come in handy as well to take out their shields. They are generally seen leading lesser Jiralhanae, Unggoy and Kig-Yar into battle. Despite possessing much stronger shields than the Captain Regulars, and slightly stronger than the Captain Majors, they are still a bit below those of a Sangheili Major: in fact, on the Normal difficulty, a single shot from a particle beam rifle will destroy the power armor of an Ultra, but won't completely drain the shield of a Major. Interestingly, neither a Captain Ultra, nor any other kind of Jiralhanae Captain, has ever been seen manning a Wraith or a Prowler. Also, the only way to make them drive a Chopper is to let yours be hijacked.